A specially formulated heavy bodied, medium setting, high strength PVC solvent cement designed for joining larger pipe sizes. For use on schedule 40 and schedule 80 pressure pipe and fittings through 12″ diameter. Applications include potable water, conduit, sewer, and drain, waste and vent(DWV) systems. 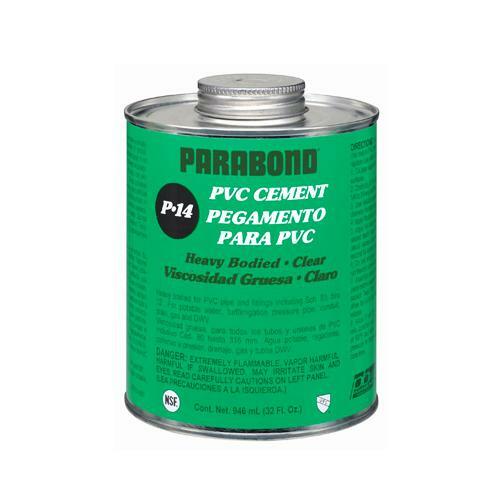 When used for pressure applications, pipe and fittings 5″ diameter or larger and schedule 80 systems, use of Parabond C-60 primer prior to cementing is recommended. Temperature application range is 40o -110o F.3 Year shelf life.